There are so many ways you can eat an OREO cookie – crushed into a pastry crust, crumbled on top of a sundae, whipped into a smooth cold concoction, or even deep fried (yes, really, Google it and you’ll find a plethora of recipes and how to videos). But nothing really compares to eating an OREO in the best, simplest form…straight up with a glass of cold milk. 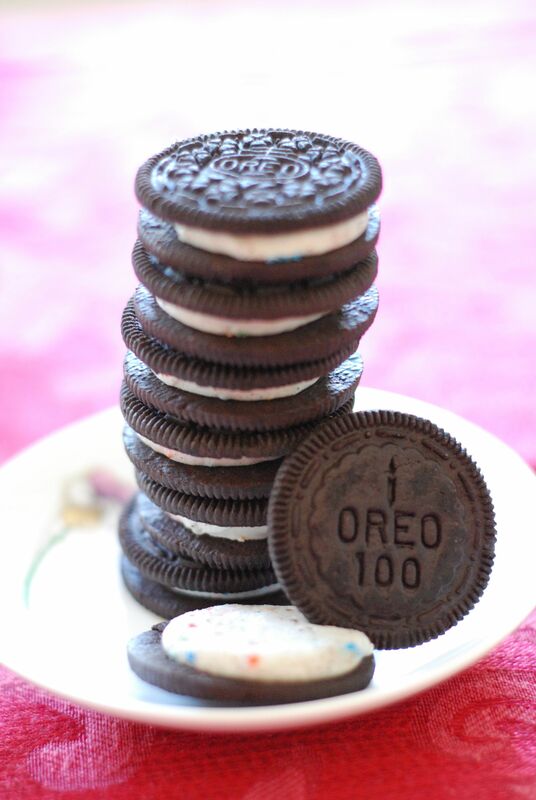 Because of this momentous occasion I decided to create a category “The Great OREO” and add recipes that utilize the OREO throughout the year. 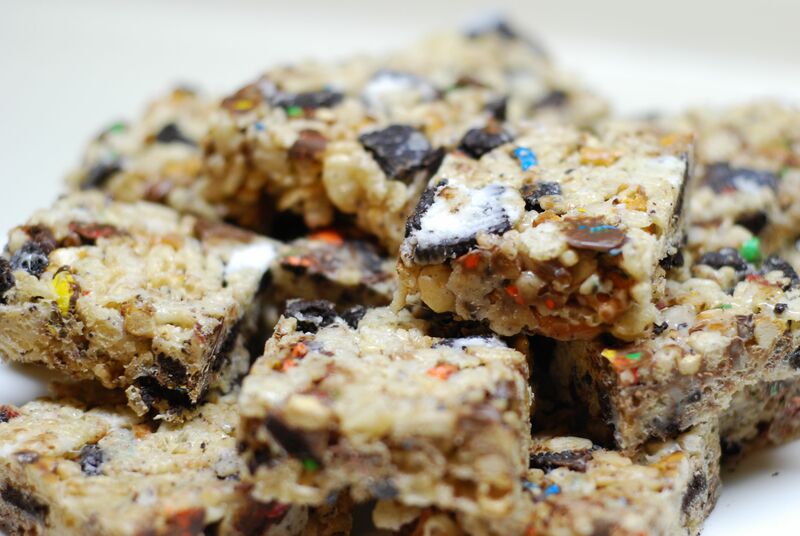 * NOTE: Chocolate chips and M&Ms will melt when mixed with the marshmallow. Some pieces will stay whole but most will melt and the M&M candy shell will crumble and become flecks of color throughout the bars. If you prefer not to have the melted bits throughout the bars you could melt chocolate chips and drizzle thin stripes on top of bars. Be sure the chocolate is set before cutting. Prepare an 8×8 pan by rubbing bottom and sides with butter. NOTE: A silicone spoon rubbed with butter works great with marshmallow! 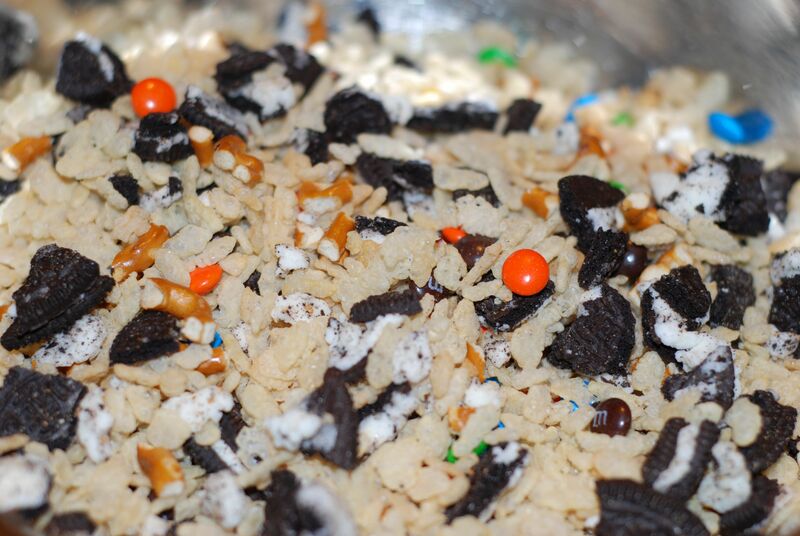 In a bowl, combine Rice Krispies, OREOs, pretzel, and mini chocolate chips or mini M&Ms. Set aside. Place butter and marshmallows in a large microwave safe bowl. Microwave on high heat for 1 minute. Stir marshmallow and microwave for an additional 15-30 seconds until mixture is melted (continue heating at 15 second intervals if not completely melted). Add Rice Krispie mixture to marshmallow and stir until combined well. Press mixture into the prepared 8×8 pan and let set for about 1 hour (can place in fridge to make it set faster). Cut into squares. Makes 16 – 2”x2” squares. This recipe can be doubled if you want to make a 9”x12” pan. NOTE: When melting caramels use a bowl about three times the size of the ingredients because the milk will bubble up when heating. Preheat oven to 325°. Place mini cupcake liners into mini cupcake pan. Mix OREO Cookie crumbs with melted butter. 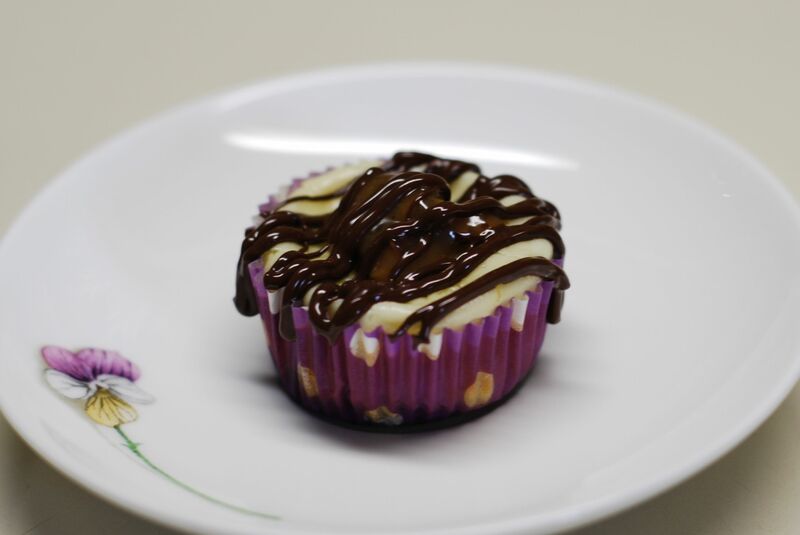 Distribute mixture among 24 mini cupcake liners. Press crumbs into bottom of cupcake liners. Place caramels and milk in a microwave safe bowl. Heat on high for 1 minute. Stir caramel to make sure it is melted evenly. 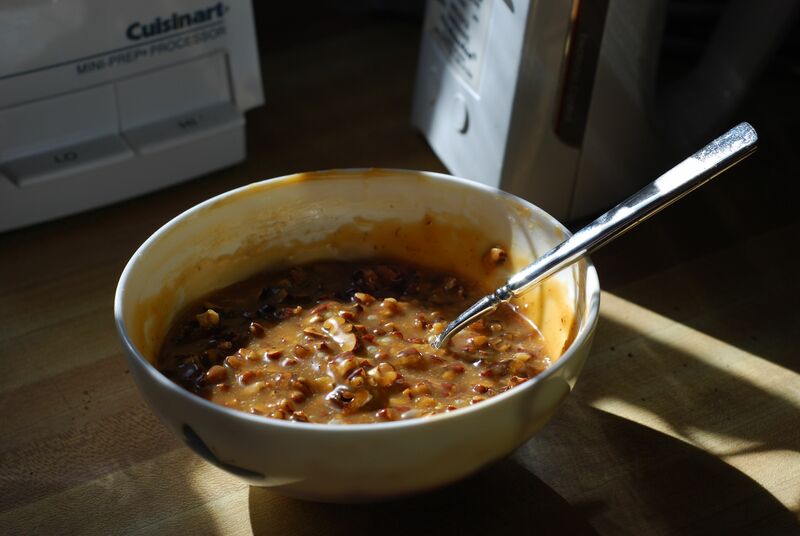 If it needs additional melting, heat for 15 second intervals, stirring between. Add pecans and mix until combined evenly. 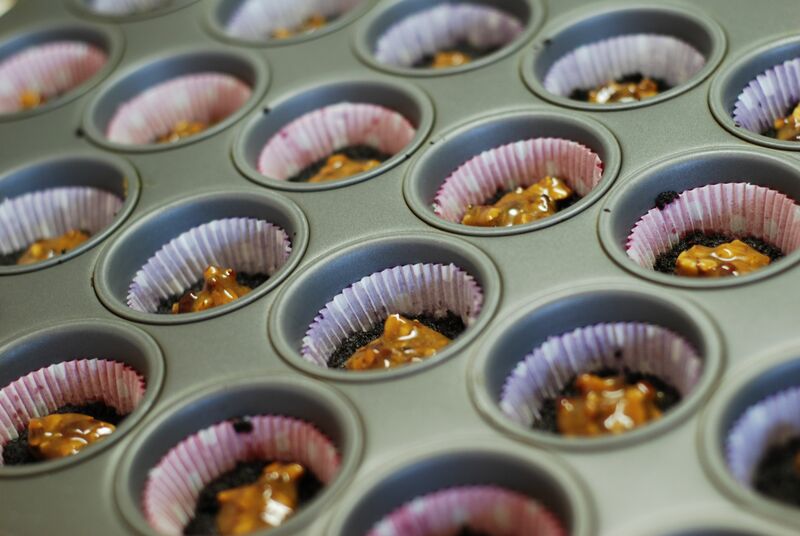 Using half of the caramel-pecan mixture, place about a half-teaspoon on top of OREO crumbs inside each cupcake liner. Cover the remaining half with plastic wrap to use later. Using an electric mixer, beat cream cheese, sugar, and vanilla on medium speed for 1 full minute. Add the egg and mix on low until just blended. Distribute mix evenly among cupcake cups. Bake for 12-15 minutes (center may split but they should not be browned). After cheesecakes are cooled off, microwave reserved caramel-pecan mixture and distribute evenly among cupcakes. Next, place chocolate chips into ziplock bag. Heat with the bag open on high for 30 seconds. Knead bag gently. If chocolate needs to be melted more continue to heat and knead for 15 second intervals. When chocolate is melted smooth, zip close bag pushing out most of the air. 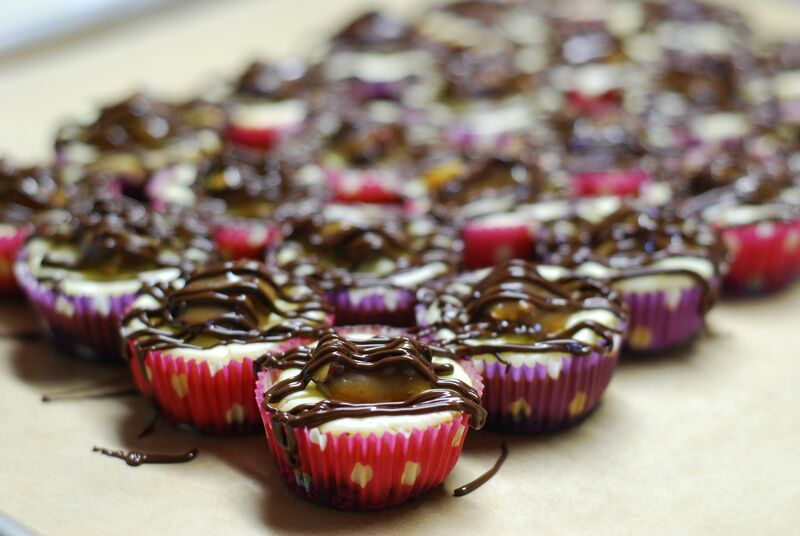 Cut the tip of one of the bottom corners and squeeze bag to pipe chocolate drizzle onto cheesecakes. § 2 Responses to Happy Birthday OREO! The picture of Oreo cookie crumbs made me want to grab a spoon… Cue ongoing chocolate craving. Love it, can’t wait to try some of these! Love the recipes and the pictures really help in assisting what the final outcome should look like! Makes me want to go out and buy Oreo’s! Thank you! You are currently reading Happy Birthday OREO! at Hestina's Kardia.